Maria Theresa was decidedly less attached of the old etiquette than her father had been. She mitigated it, and was often glad to take advantage of her pregnancies, and later of her widowhood, to modify or escape it. […] She defied convention in a number of other ways. She froze her courtiers with the draught from the windows she insisted on keeping open; she loved to walk and talk in the gardens of her palaces; early in her reign, she danced, rode and sledged with abandon. She was relatively accessible, and won the devotion of many by her spontaneity and generosity. She liked to exempt friends and favoured visitors from rules of etiquette. She had her old governess, a mere countess Fuchs, buried in the family vault of the Habsburgs. She exploited what seems to have been elaborate conventions enabling the ruler and her family to appear incognito more or less when they pleased. 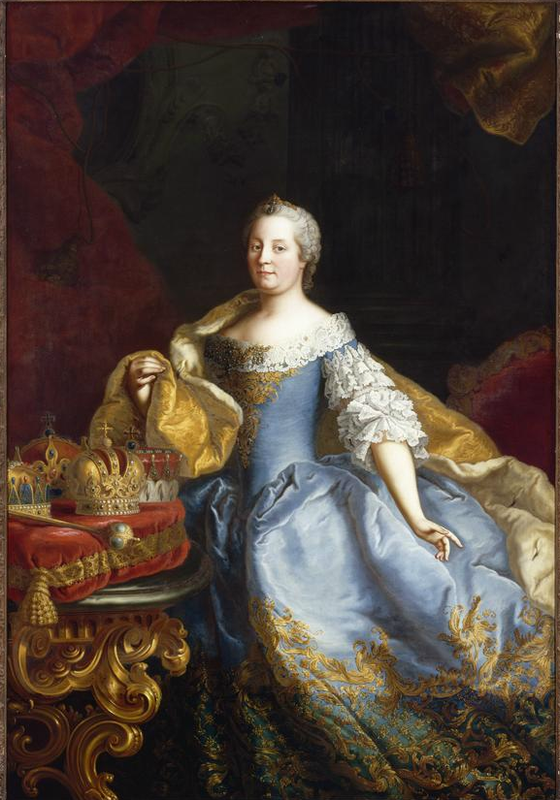 She loved referring to herself as a mother of her subjects rather than their ruler. She showed at times a passionate devotion to her children, especially in nursing them during attacks of illness, even including smallpox, which Joseph had in 1757 and Charles two years later. She and her husband cultivated simplicity in the family circle, in the style captured by her daughter Marie Christine in her painting of their exchange of Christmas presents.